How do we make art. How do we maintain our art practice. Where do we look for help. 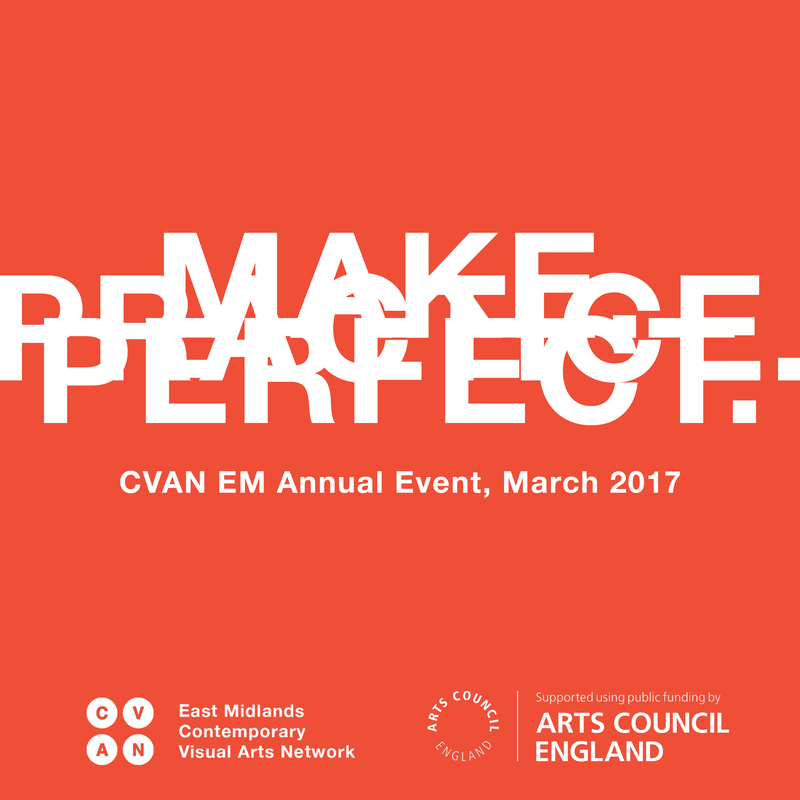 At its 2017 Annual Event, Make.Practice.Perfect., CVAN EM along with guest contributors and attendees will consider how we make art and maintain an art practice, where we turn for help in the process and practice of making art, if we are looking in the right places and whether we need look at all. Aimed at artists, students and academics, as well a non-practising public, this daylong event discusses how, where and why we produce art works today, what are the barriers to production and how we may overcome them through our working methods and accessing relevant networks and resources. CVAN EM Document artists (Andrew Bracey, Geoff Litherland, Jessica Harby, Kajal Nisha Patel, Tim Shore, Tracey Kershaw) will collectively consider what has been of benefit to them in pursuing their practice. Art and capital, does art need money to be produced. Daniel Sean Kelly –artist, co-director of Two Queens and School of the Damned student 2017. Daniel will consider whether or not we need an art education. Joanne Lee– photographer, writer, researcher and publisher and Senior Lecturer in Graphic Design at Sheffield Hallam University. Joanne will consider the notion of procrastination and what stops us from making work. Mark Smith– Executive Director, Axisweb. Mark will consider out of the gallery practice, support structures and DYI practice. Roma Piotrowska – Exhibitions Manager, Ikon Gallery. Roma will consider the notion and practice of useful art, self organisation and user generated content. Contributors will pose a provocation to stimulate engagement from and discussion amongst attendees. Interactive sessions will consider what are the barriers to making work and whether they are perceived or actual, as well as what opportunities are available to us and what changes we can effect in the region to support our practices. See the full programme and the contributors’ biographies. Following the event, Dizzy Ink will lead a workshop in Nottingham on for Make.Practice.Perfect attendees to collaboratively create a two colour beak zine, featuring a set of principles and actions agreed on at the event and a design of their own using content from the event. Our Annual Events are designed for and to inspire an open and diverse audience of those working in the sector as well as non-arts professionals. Featuring keynote speeches, discursive breakouts, informal networking and member contributions, these events allow us collectively to explore ideas relevant to the sector, capitalise on the knowledge, skills and assets of the network and expand its terms of reference and aspiration.